Place this portable mini exercise bike on the floor and cycle to strengthen legs. Place portable exercise mini bike on a tabletop and operate with your hands for firming up hard-to-tone muscles under upper arms. 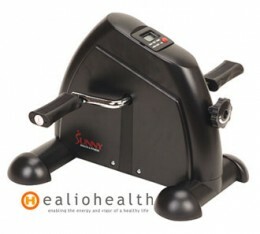 Turn the dial of the mini exercise bike to adjust the resistance from a light work out to a rigorous one in seconds. Built in computer with easy to read LCD screen shows distance, time, calories scan, reps, and total reps.